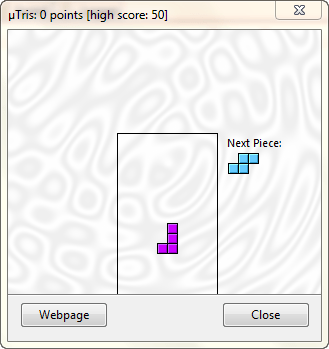 Recently when I was surfing internet, I found that we can play a small Tetris game that?s hidden in uTorrent. 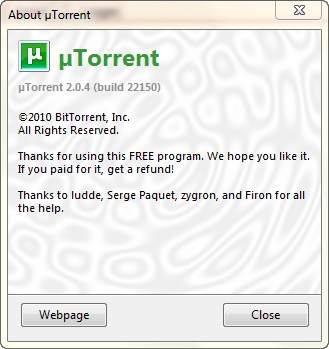 All you need to do is open the uTorrent client. Go to the help tab on the top menu bar and click on ?About uTorrent? When the About uTorrent windows opens. Press T.
You should now be able to play the Tetris game. Many of you might be having the same problem that I faced. I don?t know about the other antivirus software but the Kaspersky was the one that was causing the network trouble. My problem was that whenever I tried to create a ad-hoc network or when I was in my home network through wireless, I could not access my laptop through other computers but other computers were accessible through mine . Of course it was secure but it was frustrating when I could not access my shared folder or file from another PC. All other computer was on the network and file transfer could be done both ways in other computer except my laptop. But I was not having the problem when I connected my laptop through cable. I double checked windows firewall setting manually and allowed all those file sharing and remote connect protocol but that would not solve my problem. Later I finally figured out what the problem was. When I am at home I connect to my router through wireless. Other computer at my home are connected with cable. 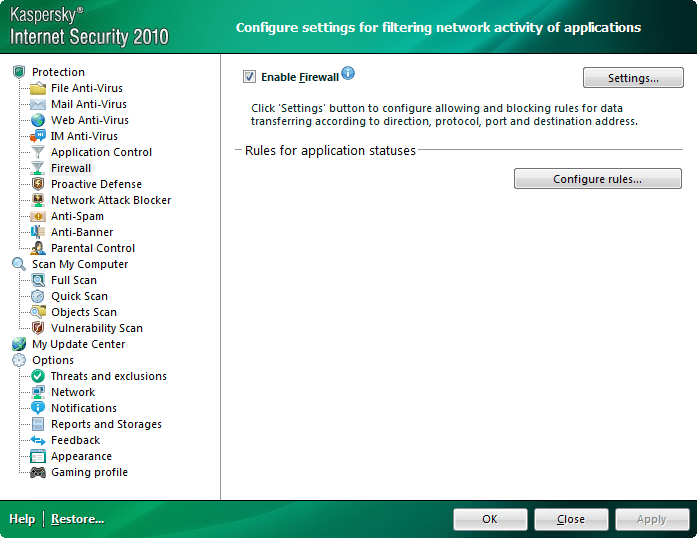 So I had my Kaspersky antivirus on automatic settings i.e it would decide what was better for my computer. When I was going through the Kaspersky I found the Kaspersky has a firewall of it?s own that monitors my network apart from my windows 7 firewall. So no matter what was allowed through the windows firewall it was blocked through the Kaspersky firewall. So what was happened was the Kaspersky antivirus would automatically assign all the wireless network to a public network regardless of windows 7 firewall settings. If you set your wireless network to Homegroup in network and sharing center and the wireless network is in pubic profile in Kaspersky your computer would not be accessible through other computer. So if you are using Kaspersky antivirus and Using wireless devices to connect to each other here?s what you need to do for your computer to be accessible for others. Click on the firewall on the left hand side. And click the settings on the right hand side. Click on the Networks tab. This lists all your networks. So in order for your computer to be accessible for file sharing or remote connect purpose the network you are connected must either be a local network or a trusted network. My wireless device ?Dell Wireless 1397 WLAN Mini-Card? connects to a network. In the figure it is now connected to a Network named SUREN. There you can see its status as local network. So be sure to change your network to local or trusted network for a file sharing. This can be done by right clicking the connected network whose profile you want to change. Note: You do not want to change other wireless network to local network. i.e school network or other public network. Doing So can make your computer vulnerable in public areas where others can easily access your shared files. So that?s all of it. Now all you need to do is make sure that your windows firewall setting are ok for file and printer sharing. If everything is fine you will have a complete networking. Hope this was helpful. Any comments and queries are welcome.